All rentals are based on check in after 2pm on the day of arrival and check out before 10am on the day of departure ,a none refundable deposit of £50.00 is required to secure the booking,plus £50 breakages bond refunded after your holiday if there is no damages, full balance to be made 6 weeks before arrival date . New for 2018, 2 bedroom holiday home situated in a quiet area of Greenacres, 2 minuets walk onto the beautiful Black rock sands beach and 5 minuets walk to the clubhouse, swimming pool, entertainment and kids club. Porthmadog town is approximately 5 minutes drive away the camp is surrounded by breath taking mountain views and beaches. Double bed in main bedroom . Gas and electric included in price, we do supply duvets and pillows but we do not supply linen. Passes are no included in price. There is a grass area next to caravan to park your car. Off season we have Monday to Friday 4 days and Friday to Monday 3 day holidays. Peak season, school holidays 7 days only Saturday to Saturday. Our second stay this year in this great home from home from caravan. We had a lovely time except for the really stormy weather on some days. It was a real bonus to arrive back at this really welcoming, cosy caravan after a wet day! The caravan is in a very peaceful area, really near to the beach. Lovely to hear the sea!. Thank you both for a fabulous holiday and we will hopefully be booking to come back next year. I booked this little break late with only a few days notice, communication with Richard was excellent with all questions answered and receipt and map arriving to me before leaving. We were met on the day and where shown where everything was and how it all worked and made to feel very welcome. The caravan was spotless and has everything you could possibly need. The location is great, it is in a quiet area of the camp with a 2 min walk to the beach. 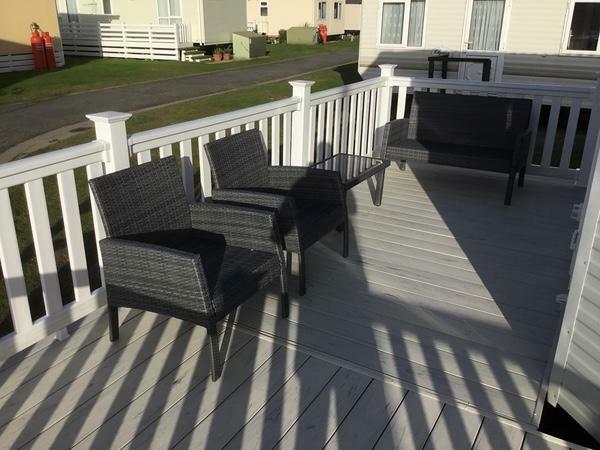 There is a lovely decking area to the caravan and though we had lovely weather for November it was still a little cold for sitting out but would be lovely in the warmer months. Thank you. We had a fantastic stay at Greenacres. The caravan was very clean and a real home from home. Very modern and all facilities you could want. Sky TV was great for the kids too. We hope to return again and would highly recommend this accommodation. This was our second stay at Richard’s caravan and once again we had a fantastic stay. The caravan is luxurious and has every home from home amenity. The location of the caravan is perfect for us, quiet spot within 2 minutes walk of the beautiful beach. You can hear the sea when sitting on the veranda. Richard the owner is a pleasure and nothing is too much trouble. We’re looking forward to a return in 2019. I booked this caravan for my mum & dad having stayed in one of Richards caravans before. My family, including my parents, are regular visitors to Greenacres and we can honestly say Richard is a fantastic host. This caravan was absolutely beautiful & sparkling clean! Richard is a pleasure to deal with and fully explains everything you need to know to ensure you have an amazing holiday. We would definitely recommend a stay here. Richard was fantastic to deal with from the onset of the booking. The caravan was beautiful and spotlessly clean with everything you need to enjoy your holiday. The weather wasn't great when we stayed but the caravan was like a home from home and the kids had a great time (they were really pleased with the T.V. in their room!). We would recommend this caravan without reservation, thank you again Richard. Had a lovely week in this caravan, was like home from home, beds very comfortable, very clean , spacious and very well equipped . Only a minutes walk from the beach. We only had one problem with the gas which Richard sorted out within minutes. We found Richard very pleasant and helpful. It was lovely to be able to sit out in the balcony. Would highly recommend this caravan. Great value for money. We recentlyspent a weeks holiday in Richards caravan as a family for 4. 2 adults and 2 children. I experienced great communication from Richard; receipts for payments, a map of the site with caravan location and a courtesy call to answer all my queries on booking followed by a call a a week before arriving. Richard always responded promptly and was always very helpful. Upon arriving Richard greeted us and showed us around and made us feel extremely welcome. The caravan is beautiful. A home from home. It has all the little extras that you don't get when booking with a holiday company. It is clean, tidy and well looked after. 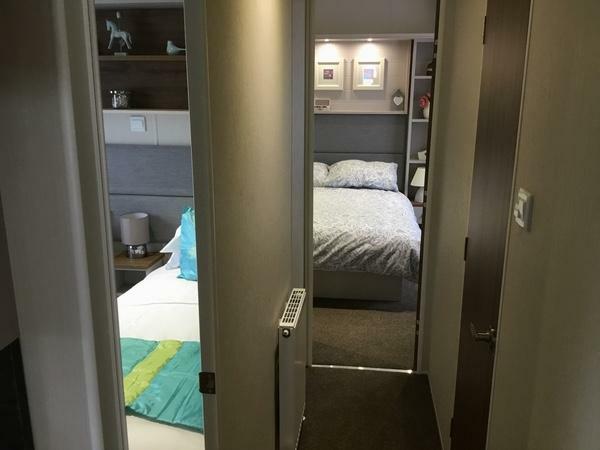 The caravan is ideally located if you love the beach. Just a 60 second walk to the side gate of the beach. If you've never been to black rock beach it's a must. Beautiful sand (proper sand) for miles. Although located a good 10minute walk from the club house we didn't mind as this allowed us to push our 2yr old to sleep on the walk back in an evening. Also it means the caravan is located in a quite cul de sac and has very minimal traffic so my children were always very safe. The caravan has all the amenities you need and more. Large fridge freezer, microwave, iron, hairdryer, walking in wardrobe, 2 bedrooms with showers, sky tv, tv's in bedrooms just to list a few. The large wrap around decking it great too with comfortable seating for a nice sit down whilst the children played. There's so much to do in the area, on and off site that we can't wait to stay again. This is the first time I've made a repeat booking for the following year. It was such a great holiday we want to repeat. We had an excellent holiday in this very clean and modern caravan. Stayed with my wife and 18 month old daughter. Perfect location overlooking the dunes and a nice view of the sea. Can’t wait to return next month. We wish we could rate Richard's mobile home higher than 10/10. Another wonderful break. Perfect caravan, spotless and in a great spot. 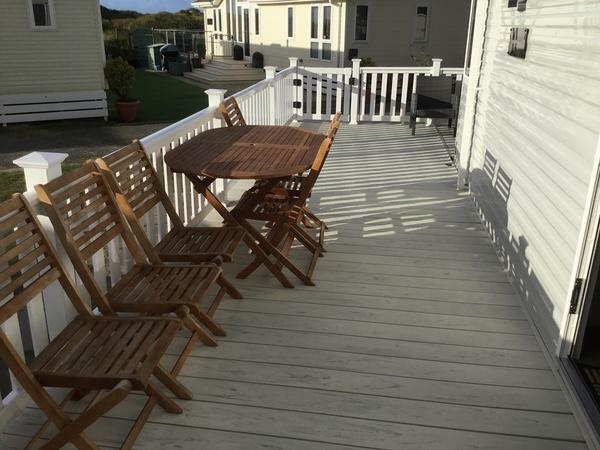 The decking and furniture is fantastic and we were blessed with sunny warm weather in April. It has every comfort you possibly need and is only steps away from the beautiful Black Rock Sands beach. Thank you once again. Caravan was absolutely stunning! Superb location and wonderful people to hire the caravan from! Couldn't wish for anything more and really hope to stay here again, I don't think it can be beaten!! Thank you so much for giving us the perfect base for a wonderful break away!! We arrived and the owners were waiting for us. Richard's map was very helpful! Richard and his wife were very welcoming and we were shown where everything was, the timer on the boiler and Sky TV. Everything we needed was there too. The caravan was spotlessly clean. We had a great relaxing week, just what we needed. The shower was excellent and the furniture very comfortable. The week seemed to go by so quickly and in no time we had to pack up again to come home. The caravan was in a good spot and very quiet too.The weather could have been kinder but no one can do anything about that! We decided then we would like to come back again for another holiday in 2018. Thank you both. I cannot recommend this caravan and the owner Richard enough. We are grandparents who had 2 grandchildren age 9 on holiday at the caravan. The caravan has everything you would need to enjoy your holiday, with many extras even bucket and spades for the beach. Very spacious caravan, 2 bedrooms. Main bedroom open suite. Main bathroom with great shower. Large lounge with French Doors. Immaculate through out. Richard went above all expectations when we had problems before finally arriving at caravan and helped in every way he could to make the start of our holiday. Which we greatly appreciated. We will definitely be returning. Thank you so much Richard. Had a fantastic holiday, caravan has everything you need and more. Located in a nice quiet spot near the beach surrounded by other caravans with familys. The 2 boys cant wait to go back and see friends they have made this year. Thanks Richard. 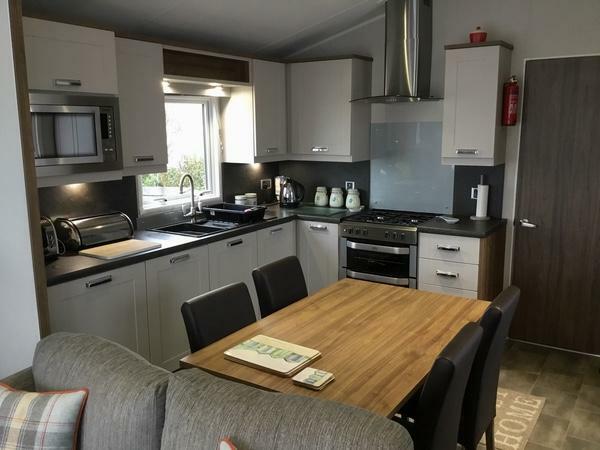 Just returned from a wonderful stay at this caravan which was immaculate and contained everything you need for the perfect holiday. Richard, the owner, met us when we arrived and was very welcoming. Looking forward to returning next year. Had a fantastic break in this beautiful caravan. We could not find fault in Anything. We cannot recomend this van enough, very high standards. We cannot wait to return with the Grandchildren in the school holidays. Richard is a lovely person and nothing was too much trouble. This is definitely the best caravan we have stayed in so far- it was spotlessly clean and very spacious with all the mod cons you get at home. It is situated in a quiet part of the site which was lovely, and really close to the fab beach! The facilities at Haven were great too and we had a fantastic time! We will defiantly be staying here again- thank you! I cannot rate this caravan highly enough. 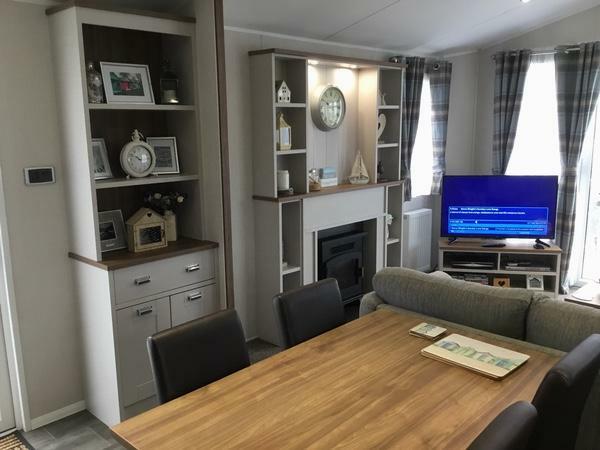 We have stayed in lots of haven caravans and if you are looking for a top of the range caravan with sky tv and wifi this is the place to stay. Richard and his wife provide all the little extras you could possibly need and give a first class service from booking to return of deposit. Do yourself a favour and save a lot of money booking this caravan. We did pay extra for the passes as my 6 year old grandson used the facilities especially the pool and football pitch but if we had booked the same haven caravan it would have cost over £200 more. 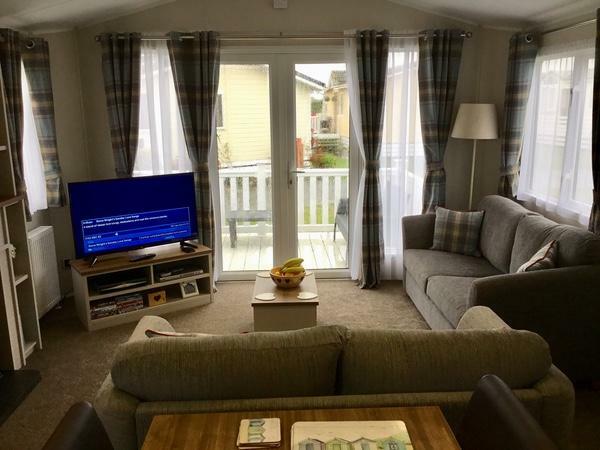 Wow what a beautiful caravan .nice &clean .lovely patio area.so close to the beach.already booked for next year see you soon .thank you richard&shirley . We had a wonderful week. The caravan was immaculate, the service from Richard was excellent and very informative. A lovely quiet location and only a couple of minutes walk to the beach. Highly recommended. We stayed here for a long weekend, the caravan is one of the nicest we have stayed in, it had everything you need and was a few minutes walk to the beach which my daughter loved. It was so straight forward and simple to book this caravan as Richard was so easy to deal with and told us everything we needed to know, we also had a very warm welcome from Richards wife when we arrived who went through everything with us, we definitely hope to be back next year. This is one of the best caravans we have stayed in. We couldn't have asked for anything more. The caravan was spotless and had everything we needed. The location was excellent, it was very close to the beach and in a very quiet cul-de-sac. Richard and his wife were very helpful. We had a lovely weekend and the children had a great time. We will definitely be booking again for next year. Got a fantastic late deal from the ever so helpful Richard really nice friendly guy, caravan was spotless and really nice, decking was a bonus with the table and chairs and in a very quiet part of the park and right near the beech...hope to use again sometime next year. Just returned from a fantastic week. Richard and his wife were very welcoming when we arrived. The kids loved how close we were to the beach. The kids have already asked if we can book again for next year. Very modern, nice, clean caravan. Biggest main bedroom we've had in a caravan with King Size comfortable bed. Good to meet owner Richard on arrival. Lots of added extras especially the toilet rolls, towel, teabags and even milk which was great after a long journey before we got to unpack! Great location away from the entertainment complex, so nice and quiet and only a couple mins walk to the beach. Would highly recommend staying here. Thanks Richard. Beautiful caravan, with lovely owners. Been to many site owned and privately owned caravans over the years and this is the best one yet. An owner who knows what you need when you arrive and there to greet you. Many thanks Richard for letting us stay in your lovely caravan. We had a wonderful holiday, the caravan is beautiful & has everything a family needs. The caravan is ideally positioned for the beach & it is so peaceful there. Excellent booking service by Richard, he explained everything thoroughly. We will definitely be returning next year. Thank you Richard. We have just come back from staying at Greenacres. Amazing caravan, very clean. The caravan is in a great location for the beach and the children were so happy there. Very spacious for our family of five. Very modern with all the little extras. Richard is a very helpful and friendly man who met us on arrival. The site is fantastic too. We are definitely going to return to this caravan, can't wait!! Thanks Richard. Lovely caravan in a amazing area, very clean and tidy, friendly owners very welcoming. Will be coming back very soon!. Beautiful immaculate caravan. You would think you were the first to stay there. Tucked away right by the beach in a very quiet spot. All your essentials there already such as tea, coffee, toilet roll, cleaning bits & bobs etc. Cannot recommend enough! Fab customer service received from Richard who was in regular contact from the moment I enquired. The Sky box was a hit with all the channels including the movies. Just perfect for a peaceful getaway. Deposit was put back into my account the following day after we left. My sister and I booked this caravan so we could join our brother and sister in law (who were staying in a Sun offer caravan) for a short break. We have rated it 5 star ourselves because that is what it is. We loved where it is sited, it's comfort and luxury and its homeliness. It was spotless and having Sky was a bonus. Apart from the Monday the weather was lovely and we visited many places. We went on the steam train to Blanau Festiniogg for the first time and it was amazing. This area has so many beautiful places and beaches, it would be hard to choose a favourite one, but of course, although it is some time since being there, Black Rock Sands is just as lovely as I remembered it. Sitting on the decking with a cup of tea watching the sunset was amazing. 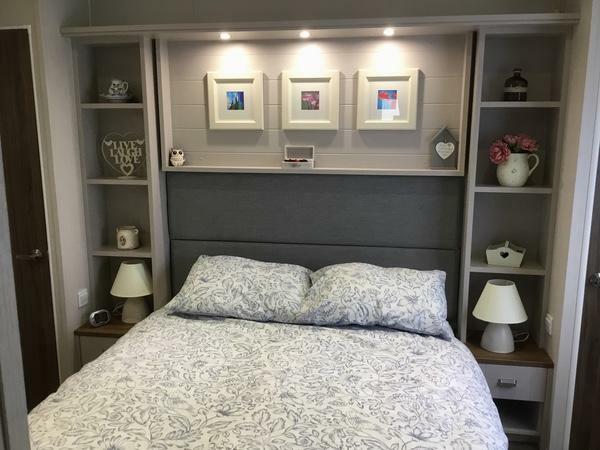 Everything with the booking process and contact with Richard has been very good and straightforward and it has been a pleasure to stay in his caravan. 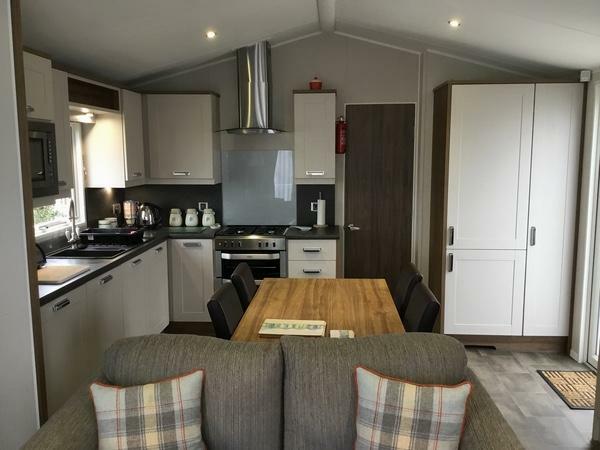 We would certainly return and do prefer to book a private caravan rather than through the site, because there is no queueing at reception and sometimes you can move in earlier as well. Thank you Richard for a lovely stay. Another superb stay in this first class holiday home. Everything was absolutely perfect - we were even blessed with sunshine! Every comfort one could imagine. The new addition of the deck was perfect. We shall definitely be returning again. Thank you Richard and family. We recently enjoyed a wonderful week's stay in this stunning caravan. Richard the owner made us feel very welcome by sending us a map of the site straight after we had booked and then met us on arrival showing us around his beautifully furnished holiday home. We had absolutely everything we needed for our stay, it was immaculately clean and tidy and very homely which we thought added a perfect touch. It is only 2 minutes walk to the beautiful beach, which our 2 year old son thourougly enjoyed and is also situated in a quiet area away from the entertainment complex, it was lovely to listen to the sea most nights on the balcony equipped with a wooden table and chairs. We would definately recommend staying here and would love to book again in the very near future. 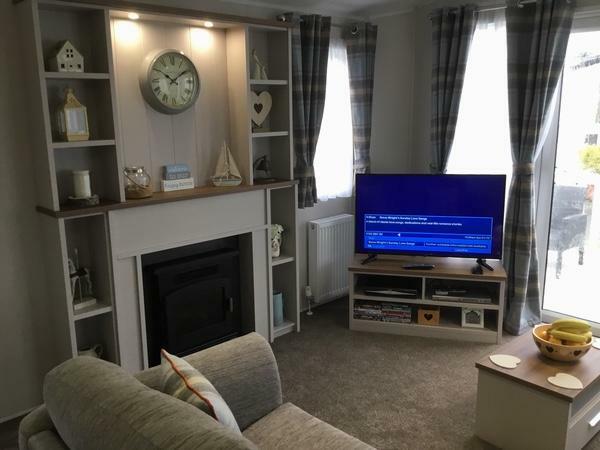 Thank you Richard for being so attentive and informative, it really did make all the difference from previous holiday homes we have stayed in. 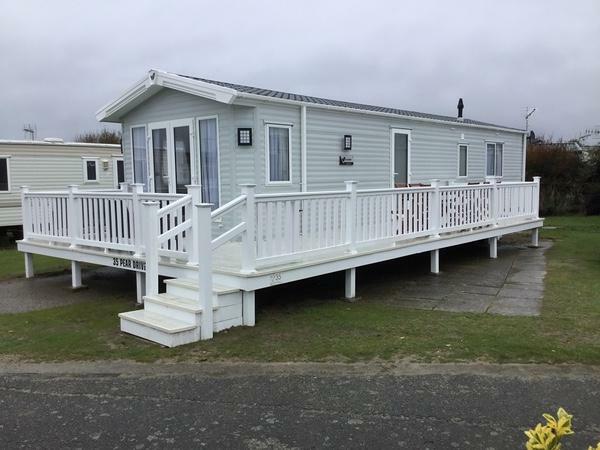 We have just returned from a fabulous week away staying in this beautiful brand new caravan. We could not have asked for anything more, it was extremely comfortable, warm, roomy, clean, homely and had everything you could need including a beautiful new travel cot for the baby with padded mattress for additional comfort. A short walk away from the beautiful beach and in a quiet location it was perfect for our family. Richard the owner was exceptional in his communication and met us on arrival to show us how everything worked. We had a fabulous time staying here and would not hesitate in recommending it. Thank you Richard. lovely brand new caravan. lovely rooms & decor comfy bed. its like a home from home. nice decking to sit out in the evenings. richard & shirley very helpful. ideal spot & handy for the beach. we will book again next year. We have stayed in a lot of caravans on this site and this one is by far the most comfortable and relaxing we have stayed in. We couldn't have asked for anything more. The caravan was spotless and had everything we needed. The location was excellent, it was very close to the beach and in a very quiet cul-de-sac. Richard, and his family, were very helpful and explained everything to us in great detail. We would definitely stay in this caravan again. WOW! What a gem. 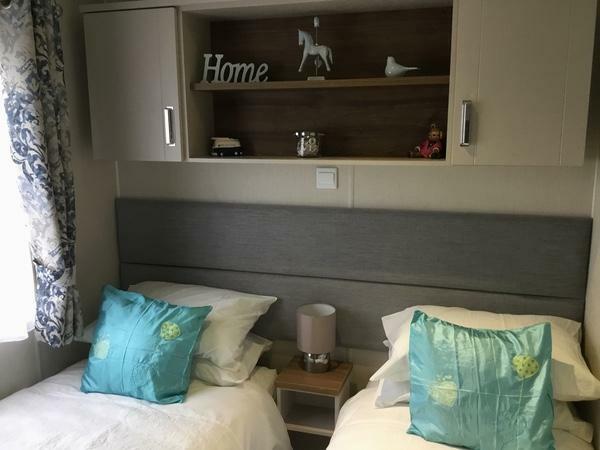 This caravan has to be the most comfortable, clean and well equipped that we have ever stayed in. Location is excellent; a nice quiet cul-de-sac, close to the beach. Richard the owner was exceptional in his communication. Absolutely perfect for our family with older children/grandparents holiday. It is so good, we have already booked up to go back twice more in 2016! Thank you Richard for allowing us to stay in your beautiful caravan. Just returned from a week stay in this beautiful caravan...Richard and his wife meet us on arrival with lots of help and advice. Such a lovely couple. From when we first enquired about the caravan Richard kept us fully informed of everything. The caravan was beautiful, the interior was extremely modern and had everything you would need, all we needed to take was bed linen. Definitely return to this caravan and the site, and would very strongly recommend it. The caravan was spotless clean light &airy. Lovely balcony to sit out in the evenings .quiet area of the caravan park . The owners were very friendly & helpful we will book again .see you soon . Had a fantastic time - caravan was spotless & all facilities worked perfectly - lovely shower - the addition of the decking area was wonderful. Very close to the beach & the beach entrance - literally takes a minute to get there, couldn't be better situated. Excellent friendly service by Richard, explained everything in detail & also met us in person. No traffic noise, quiet corner of the caravan park. Would definately use this caravan again, thanks. Fantastic holiday in this top class caravan, spotlessly clean, with all mod cons. Excellent location just a two minute walk to the beach. Owner Richard and wife extremely helpful and very friendly. Lovely warm greeting on arrival. Would recommend booking with them. Had a fantastic holiday, the caravan was excellent with its own balcony, in a perfect quiet location and only a 1 minute stroll to the beach. The children (age 10 and 11) enjoyed the facilities on site and playing in the sand dunes, flying kites, riding bikes and swimming in the clear sea. The booking process and communication with Richard and his wife was very good, greeted on our first day with helpful advice. Highly recommended. Beautiful modern caravan. We had a great stay here. Owner was extremely helpful. We'll definitely be booking again. Had an excelle t holiday in a first class caravan with a mod cons in a beautiful location of the park just a short stroll from the sandy beach and dunes. Kids loved the balcony having their tea in the sun felt like we were abroad and it was safe for the little one as it was in a quiet cul de sac . Would recommend to everyone no faults and the owner was extremely helpful and greated you on arrival cant wait go back. 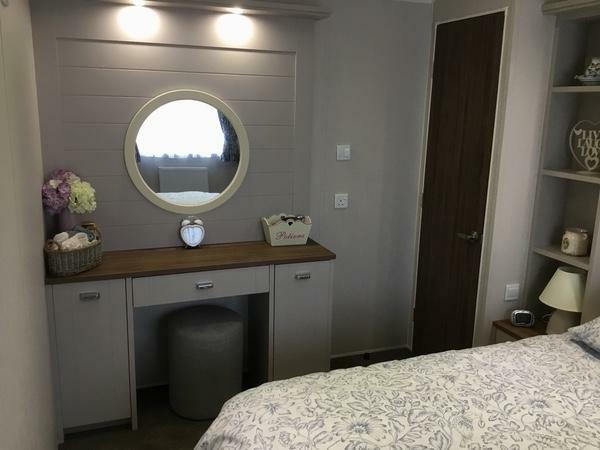 A beautiful new caravan in a quiet area but very clean neatly manicured site. Had an enjoyable stay here. The owner, Richard, is extremely helpful and accommodating. The van is well equipped with super, cosy duvets - just bring your own bed linen. It is so well positioned, only a short walk to the beach, down a path at the side of the van. We had a fabulous time at this great caravan. Plenty of space to meet our needs with two young children. The decking area was great and caravan was spotless. Very friendly and efficient service by Richard. Great quiet location with close access to the beach.